The signs will help people know that they are in a unique landscape that has been designated for the whole nation and deserves special care and attention. Every location has been carefully selected at key entry points to the landscape and each sign's size and design have been tailor-made to fit its surroundings. The signs are made from iron or a mixture of wood and iron – reflecting the history of iron work in the South Downs during the 17th and 18th centuries and that the South Downs has the most woodland of any English National Park. The sweet chestnut wood used in the signs has been locally sourced from the Stansted Estate by English Woodlands. The white lettering reflects the chalk landscape of the South Downs. 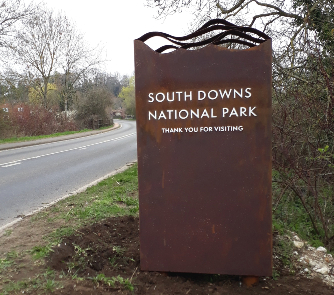 "These beautifully-crafted signs pay homage to the heritage of the South Downs and welcome people to a precious landscape, reminding them that it should be enjoyed with care and respect. "Throughout history boundary markers have used local materials to reflect a community"s pride in its place. These bespoke signs are part of that tradition. "They add to the National Park's value as a destination to visit in support of local businesses, including our top-quality food and drink producers and the many well-being and leisure opportunities that the South Downs offer. "We will carefully assess the response to the first 19 sites before deciding whether to proceed with further locations." The signs draw upon the National Park's Shared Identity, which is a place brand for the National Park and is used by local partners, stakeholders and businesses to show they are part of a unique place. "The signs were designed to respect and pay homage to the heritage, beautiful natural form and materials of the National Park. "The form of the signs echo the rolling landscape of the SDNP and allow a viewing point through the sign to the scenery beyond it. "Cor-ten steel reflects SDNP's ironworks heritage, this material rusts organically allowing it live and breathe alongside its habitat."